The hotel thel is surrounded by a beautiful natural landscape. All this beauty is called la Gorge d'Ardeche. The famous Chauvet cave is nearby. Despite the fact that the hotel can be no more than one night, the comfort is below average, next to the hotel there is the most wonderful thing there is-a Restaurant de Chames with really High French cuisine! Every evening a new menu! The menu is very unexpected, just amazing! Cool staff! Great regional wines! It is strange that such a miracle with such a filthy hotel! Many tourists are engaged in kayaking. The location in the gorge was great and the price very reasonable compared to other places in the area. The kitchen was surprisingly well equipped with everything we needed to cook a simple meal. If you're ready to rough it a little more than advertised, this is still a really good value place to stay. Great location, beautiful environment. The rooms are big enough, kitchen is well equipped and comfortable. Staff is kind and responsive. We have loved canoeing on the river, swimming etc. The location is really top. Lots of space, good if you were self catering, and efficient heating, plus it had a bath as well as a shower. I liked the proximity to the main attraction in the area 'pont d'arc'. Possibility to order croissants and bread for breakfast. On-site restaurant. Nice view from the balcony overlooking the grounds, but the river is not visible. 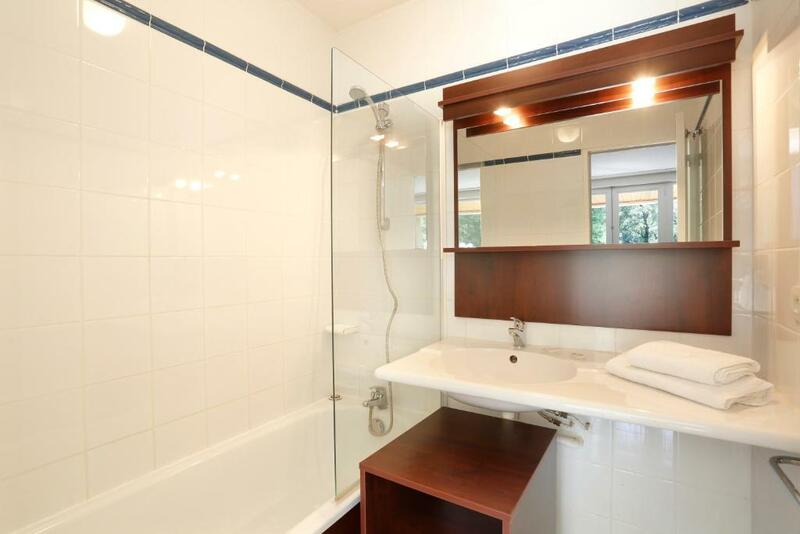 The location and proximity to a lovely restaurant / bar, and easy access to the river. La posizione è molto carina e il ristorante affianco (solo affiliato) è molto gustoso. Très bon rapport qualité prix. Accueil sympathique, studio relativement grand et globalement bien équipé. Parfait pour un séjour de courte durée en famille et en autonomie. 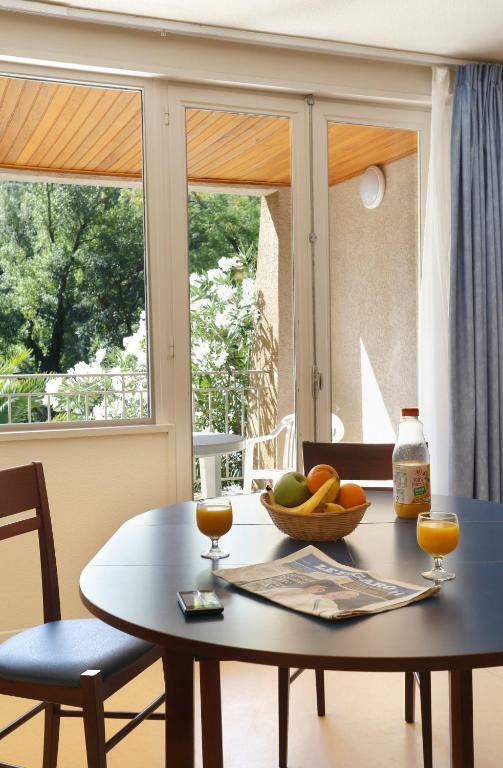 Vacancéole - Le Domaine de Chames offers self-catering studios and apartments, most of which have a garden or a terrace. It is a 10-minute drive from the center of Vallon-Pont-d’Arc and is set in a 3-hectare park, just 650 feet from River Ardèche. A restaurant can be found within a 2-minute walk. 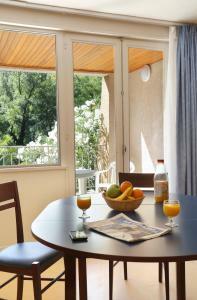 The residence offers apartments and studios for 1 to 6 guests. Each one is equipped with a flat-screen TV, a private bathroom with a bath or shower, and a kitchenette with a fridge, microwave and hotplates. Cycling, kayaking and hiking can be enjoyed nearby. Pont d'Arc is an 24-minute walk from Vacancéole - Le Domaine de Chames. Avignon-Provence Airport is 59 mi away. Free public parking is available on site. 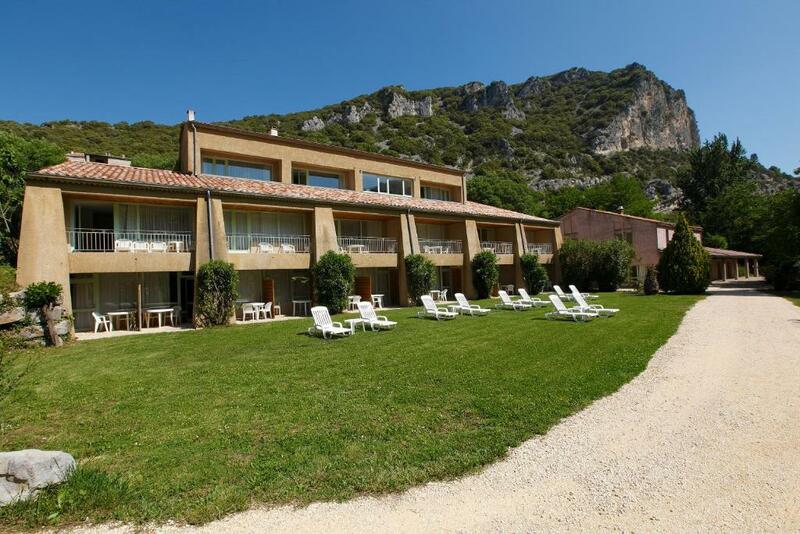 When would you like to stay at Vacancéole - Le Domaine de Chames - Pont d'Arc? This studio has a flat-screen TV. It offers a double bed, a sofa bed or a trundle bed. Vallon-Pont-d’Arc est idéalement situé, aux portes de l’un des plus beaux sites touristiques de France : la Réserve Naturelle des Gorges de l’Ardèche avec le célèbre Pont d’Arc, arche naturelle de plus de 60 mètres de hauteur. Ce paisible village est devenu une aire de jeu privilégiée pour la pratique de nombreuses activités de plein air avec en 1er lieu la fameuse descente des Gorges de l’Ardèche en canoë ou en kayak. Un chemin de randonnée pédestre longeant la rivière permet également de découvrir cet environnement naturel exceptionnel sur la terre ferme. House Rules Vacancéole - Le Domaine de Chames - Pont d'Arc takes special requests – add in the next step! Vacancéole - Le Domaine de Chames - Pont d&#39;Arc accepts these cards and reserves the right to temporarily hold an amount prior to arrival. Vacancéole - Le Domaine de Chames - Pont d'Arc accepts these cards and reserves the right to temporarily hold an amount prior to arrival. 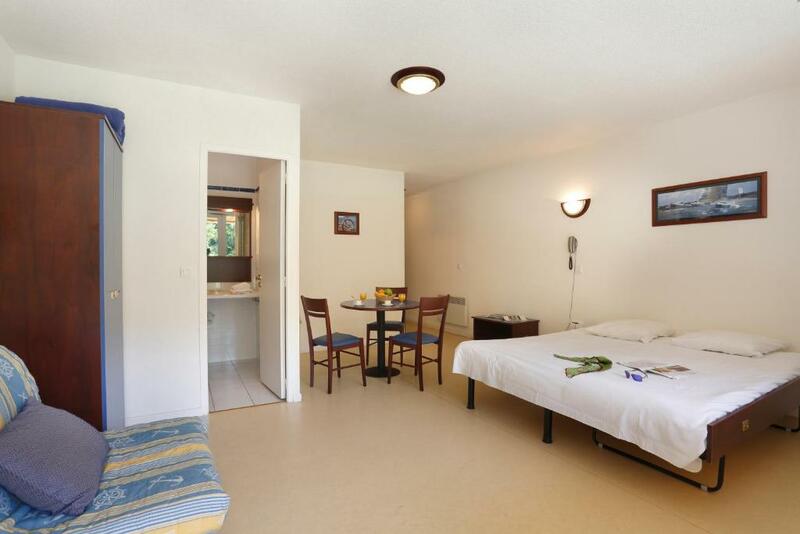 For stays from 1 to 6 nights, bed linen and towels are provided but beds are not made upon arrival. Bed linen and towels change is possible upon request and for an extra charge. End-of-stay cleaning is included in the rate, except for the kitchen area and dishes which must be cleaned by the guests. For stays of 7 nights or more, bed linen, towels and end-of-stay cleaning are not included in the rate but are available for an extra charge. If guests don’t clean the kitchenette and wash the dishes, extra fees will be charged. A damage deposit of EUR 300 is required on arrival. That's about 339.07USD. You should be reimbursed on check-out. The room was dirty! To walk bare feet on the floor was impossible, your feets become dirty immediately. Poor wall insulation. Despite the fact that Breakfast was declared, it really can only be ordered until 18-00 to get it the next morning, did not have time, you are left without Breakfast. It's good that there is a campsite nearby and there in the restaurant you can get a standard Breakfast for 6.50 euros. Without a car to the hotel can not be reached, the nearest city is 7 kilometers away. By car it is also difficult to find, the hotel is not quite visible from the road, on the road there is a pointer, but at the speed it can be easily overlooked. The room we had been booked into did not resemble what we were confirmed through Booking.com. Fortunately, there was a room available that did. It smelled weird, but was OK after airing. There were large cobwebs in the room and one enormous spider, but we got rid of it. It also wasn't clear to us at the time of booking that we would have to clean the kitchen. The comfort of the beds could be better. Wifi is only available at the reception, not in the rooms. The address given in internet when you put it in gps / google maps do not give you a correct idea for the location. It is more than 5 km away from the reality! It took us 40 minutes to find the location, with arrival late in the evening. A pre-notice about this should be given to the guests. The room is so small that once you pull out the sofa bed you avant even get to the door anymore. The sofa bed is old and loud and if you are taller than 170cm, you hot your head and feet against the metal bars. The proximity to the river is lovely. That the restaurant closed so early. It was a Sunday evening in May, but even so, they should have warned me at reception. I tried to go to the restaurant at 19.15 and it was already closed. I didn't like the note in the room about 'you will be charged extra if you leave the kitchenette unclean'. Surely you pay for a room and its eventual clean up in the price for the room! The TV was very small; only one double bed in a "superior studio" advertised for 6; soft and lumpy mattresses on the twin beds; toilet bowl could have used a good cleaning with bleach. Noisy because of poorly insulated walls. The apartment was cramped and stuffy at night. Short walk to river and views were very nice. The room was a small self catering unit on the ground floor, with a sofa bed that had to be pulled out to make a double bed. Once out it was impossible to walk out through the doors to the seating area as the TV unit blocked the way. The toilet stopped filling to flush on the evening and so we had to use pans of water to flush it. On pulling the toilet door to, the handle came off. There was an emergency number to ring if needed, but it was stressed that it was for emergencies only, so obviously we did not ring. We left at 8.30am, but there was no one on reception to tell them about the problems. We just left the key and went. Felt poorly maintained. We were told to ensure the kitchenette area was clean on leaving, but there was no washing up liquid or cloths...so we improvised. Wouldn't stay again.